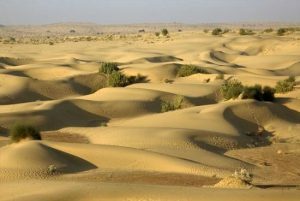 Thar desert is among the major deserts that are located in Pakistan. It is the largest desert of Pakistan among all of them. Thar desert is set on the area of more than 200,000 km2 (77,000 sq mi). It is the world’s 9th largest subtropical desert. In the Pakistan this desert has been covering the eastern Sindh province and the southeastern portion of Pakistan’s Punjab province. The Cholistan Desert is hence adjoining with the Thar desert that is all spreading into Pakistani Punjab province. However, the Thar desert is mentioned to be the largest desert of Pakistan. It has been spanning all across into the area of around 175,000 square kilometers. It is also covering the large areas of Pakistan and India.The Thar Desert is located in Bhakkar district of Pakistan that falls as in between the Indus and Jhelum rivers. Hence, 85% of the Thar desert has been located India and the remaining 15% is in Pakistan. Do you know which is the largest desert of Pakistan? However, in the north of the Thal Desert you can find the salt ranges as in the east the Jehlum and Chenab rivers and to the west the Indus river.